Each year, the Richard D. King Rotary District Speech Contest stretches from February to late April to reward the best high school speaker from our district’s 55 clubs. 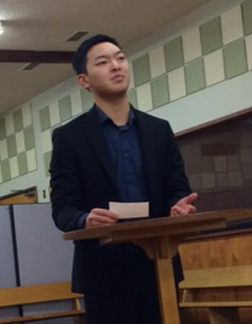 This year’s theme is “Rotary Serving Humanity” Irvington High School Senior Austin Huang, won first place in our Club’s contest with a simple but inspiring message he called "Empathy". As a clerk at In-N-Out Burgers, he makes a point to cheerfully greet each customer and then actively listens to how their day is going. In this way, he conveys that someone is interested in what they are doing and tries to help each of his customers feel just a little bit better. 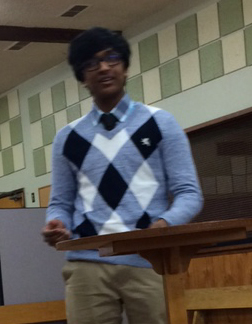 Austin will advance to the Rotary Area level speech contest in a few weeks. Coming in second place was Dhiresh Poandary, a Kennedy High School Junior, with his speech titled "Powers, Using the Gifts You Have". 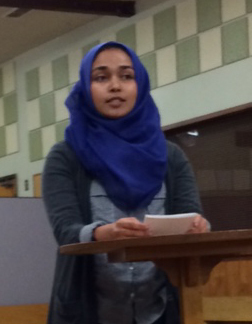 Kauser Adenwala, an Irvington High School Senior, was our third place winner with her speech "Can the Syrian War Be Compared To The Holocaust?". Each of our winners took home a cash prize. Moreover, each of them expressed a depth of thought and a skill with speaking that demonstrated that our future is well placed in good hands.